What can I possibly say about sour cherries that hasn’t already been said before? Not much, I’m sure. But, I do have a confession. I’m incredibly late to the game in my love for them. I’ve passed them up year after year, for their sweeter bing cherry cousins. A week or so ago, I took a drive up to Montgomery Place Orchards, one of my favorite farmstands, near Red Hook, NY. Not much was going on due to the cold, prolonged winter we had this year, but they had some green beans, zucchini, onions, blueberries, and cherries. Really, I was hoping for apricots to make a pie for July 4th. Sitting right next to my beloved bings were dark sour cherries. I’d never seen them that shade before, having grown used to the pale red sour cherries more commonly available. It was enough temptation to finally break my, er, cherry, with the sour variety. I used them to make a pie that evening. The pressure was on since this pie was going to a family gathering; my first time meeting my guy’s family. Baking as I normally do when not in work mode, I just eyeballed the filling, so there’s no recipe to share (yet). One bite of that pie had me hooked, and I decided there was a lot of lost time to make up for this summer. I swung by the farmstand on my way back home, and picked up two more quarts of cherries with jam on my mind. This contraption gets the messy job of pitting them done much faster (and my kiddos loved using it). I see they also make a clamp version which is a little less expensive, that I wish I’d seen first. The suction base is a bit fussy, and really needs a smooth, shiny surface to adhere properly. As I began to add sugar to my jam, I was worried about the points (argh!). 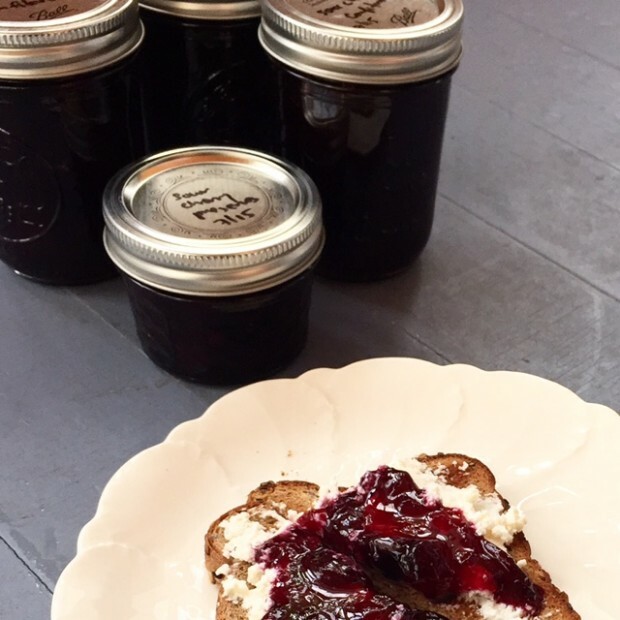 Years ago I used to make jam with Pomona’s natural pectin which allows you to make low sugar variations. I’ve since switched to making jam with simply fruit, sugar, and lemon peel. Surprisingly, the jam is well within reach, coming in at only 1 point per two teaspoons. 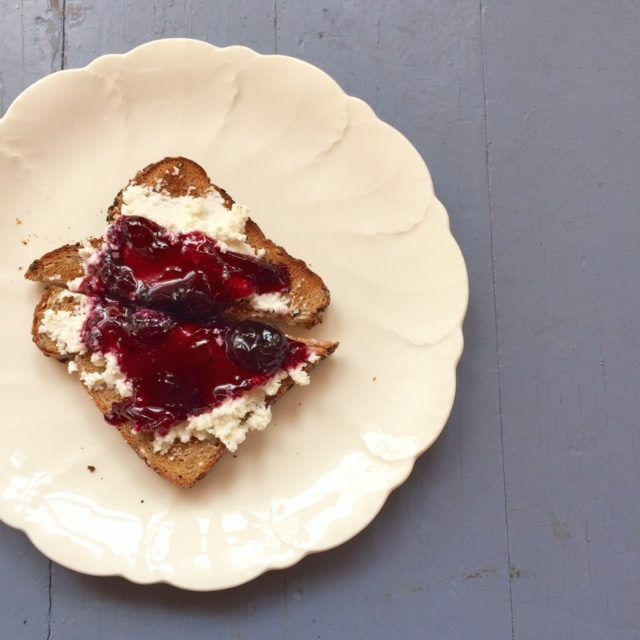 I savored every bite of that toast you see, with a smear of fresh ricotta and my very first batch of homemade sour cherry jam. So, even though I’m late to the game, I’m still a contender. Now time to go pit two more quarts of cherries. Prepare your canning jars by cleaning them in very hot, soapy water. Be sure to give them ample time to air dry completely. This batch will yield 2 1/2 pints in total. Add the cherries, sugar, and lemon rind to a deep pot (I use a 6-quart stock pot). Bring to a boil, and cook for 45 minutes, stirring and skimming off the foam every 10 to 15 minutes. Reduce the heat to a very vigorous simmer (bubbles constantly popping to the surface). Cook for 10 more minutes, stirring constantly, until the jam begins to thicken. Don’t worry that it seems a bit runny; it’ll thicken as it cools. Place a wide-mouth funnel into one of the jars. Ladle in the jam, leaving 1/4-inch head space. Repeat with the remaining jars. Place the lids on top, screw closed tightly (use a towel as the jars will be very hot). Turn the jars upside down, and let cool completely. Will last stored, unopened, for at least six months (though I’ve kept my jams all the way until the following summer). I have never made jam so I don’t understand the chemistry of it, but could you use part xylitol or stevia in place of some of the sugar? I just bought some “sugar free” jam from the store that was made with xylitol. Would help the points and I think it tastes just as good – but I don’t like super sugary things. I don’t like sour things either and that’s why I have never tried sour cherries. My grocery bag today had . . . organic Ranier’s! 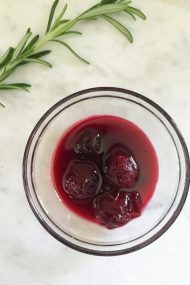 Hi Jennie I use chia seeds to act like pectin in jam. Just google strawberry chia jam for the proportions. Sounds yummy! I’ve always steered clear of sour cherries but now I think I will give them a try. And, thanks for adding the WW points! Recipe Builder and I have become good friends! 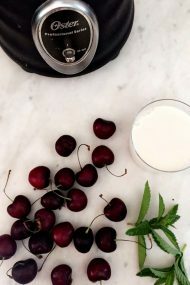 I grew up (in Croatia) with sour cherries. 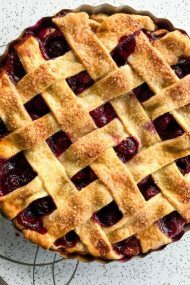 We made sour cherry marmelades, pies, cakes, “strudels”, liquors. Now, I live in Switzerland and here they do not really have the “sour cherry culture” so I planted a sour cherry tree in our garden.